We're back in Les Saintes in our favourite anchorages, off to the marina in Point a Pitre tomorrow to prepare for Ian and Alan's arrival on Friday. Yesterday the highlights were watching a catamaran getting stuck on the racing mark (great yellow balloon of a thing) and struggling to get it out from between the hulls, tee hee! 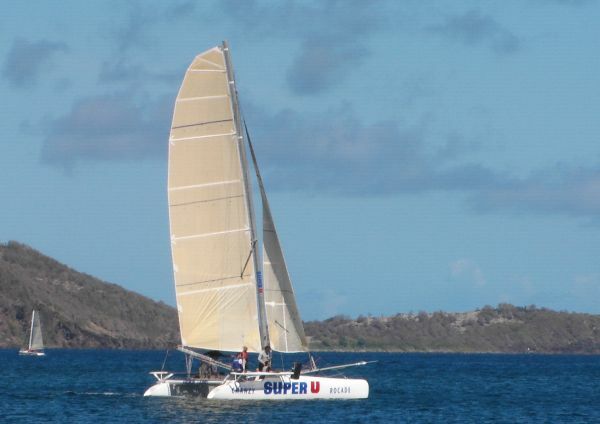 Also watching SUPERU, a different boat we hasten to add - couldn't have been more than 25 feet long - belting along at more than 20 knots. We couldn't decide what was stopping it from turning over! Here it is just heading down to the start line this morning. We are again at a comfortable distance from the upwind mark, so the fleet comes towards us hard on the wind, gets into all sorts of trouble going round the mark together and then the spinnakers flash up in a few moments as they turn back downwind. This morning the boats all got rather close and there seemed to be rather a lot of urgent discussion (ie. frantic yelling) and we think we heard a few clunks as contact was made. somewhere in the middle of this lot, there really is a racing mark. Not much else to report, here is a rare pic of the skipper (notoriously camera-shy) keeping a watchful eye on Blue Sky whilst climbing up to the fort on Ilet a Cabrit in the evening light.